Auchentoshan, in Gaelic Achadh an Oisein, translates to, “corner of the field,” is a single malt Scotch whisky which is triple distilled in Glasgow and has been since 1823. Auchentoshan distillery is located near to the Erskin bridge on the outskirts of Glasgow and was built in 1800, the distillery has changed hands since many times and was rebuilt in 1969 by Eadie Cairns and sold to Morrison Bowmore in 1984, later in 1989, Suntory invested in the company and since “94 have held 100% of their holdings. 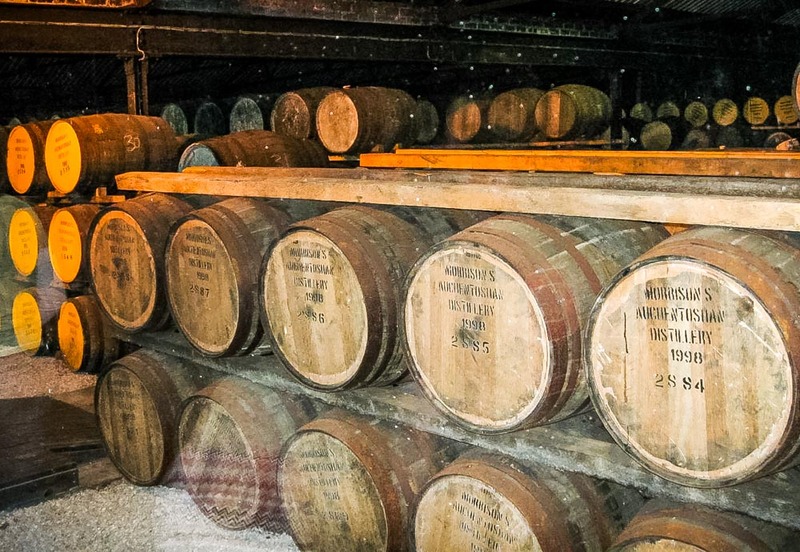 The whisky produced is smooth and with a delicate sweetness, the wide variety of whisky produced here is due to how it is aged, for example, depending on which types of casks are used and for how long it is aged, which I’ll come to later. This Lowland single malt whisky has a truly distinctive character, probably due to the distinctive way it is produced and distilled at the foot of the Kilpatrick hills in West Dunbartonshire. 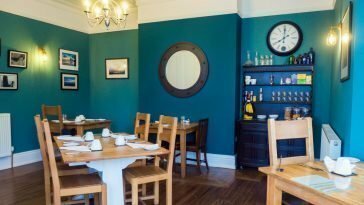 When I last visited with my family, we came across the Auchentoshan Distillery purely by chance when heading toward Loch Lomond, and I’m so glad we did. This whisky has become a personal firm favourite. They use malted optic barley, which is kilned gently and then mill the barley evenly. The milled, un-peated, malted barley and pure water from Loch Katrine will be added to the lauter tun at 63.5°C and during this process the starches will turn into sugars. After the first 2 filings it is ready for the fermentation process and the 3rd filing is used as the first water in the next mash. During the brewing process, the Auchentoshan distillery use Oregon pine rather than the stainless steel washbacks that are often used, this is not as consistent but with care gives a unique flavour, and I can tell you the aroma when walking through the distillery on our tour, was amazing. The following stage after brewing is of course distillation, an unusual production policy at Auchentoshan distillery is to always triple distil. As they say on their website, “Distilled Different.” No other distillery triple distills every drop of their whisky as standard, double distilled whisky will reach up 70% ABV where as triple distilled whisky can reach up to 81% ABV (162 proof) after distillation, up from the distiller’s beer stage at 8% ABV. During the tour we were shown a sample taken at this stage and of course at this point is way too strong to taste, the triple distilled whisky has no colour to it, it is clear like vodka and I certainly wouldn’t want to try a taste at this strength. So, what’s next? Then the distilled Auchentoshan whisky is matured in oak casks. 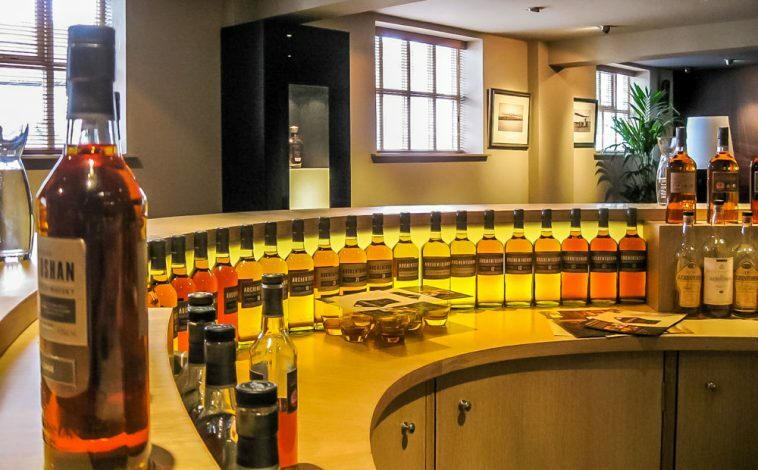 The minimum time for maturity to be called a single malt whisky is 3 years but Auchentoshan distillery also continue to mature theirs in a variety of different casks, some which have contained sherry, fine wine or American bourbon and depending on the flavours from the different casks, the woods used and the residual hints of flavour from the original alcohol the casks were used for, give rise to a beautifully balanced, smooth malt whisky in many varieties, and special bottlings are released periodically, including a 50 year old Auchentoshan, which was distilled in 1957 and released in 2008. My personal favourite is the award winning 3 wood Auchentoshan single malt whisky. The 3-wood variety is matured in 3 different cask types, 10 years in American Bourbon, 1 year in Oloroso Sherry and finally 1 year in Pedro Ximinez Sherry casks. Best served in a chilled glass on its own or over a couple of cubes of ice, nothing more, it is so smooth and flavoursome that adding a mixer would just be a shame. The colour is a rich warm tone of deep golden toffee. On the nose, caramel, toffee and unmistakable sherry notes. The flavours are a smooth toffee, slightly fruity and with a warm mellow finish. 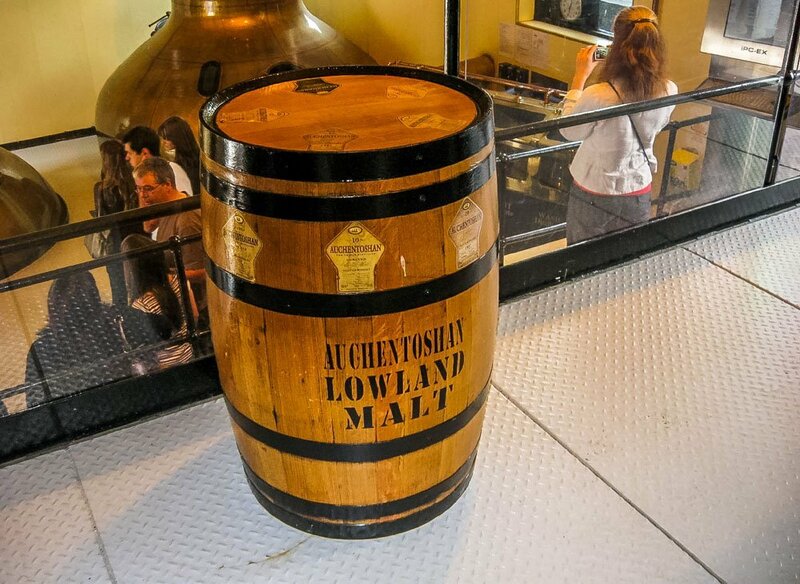 On sampling the Auchentoshan lowland malt whiskies, on completing our tour of the distillery, it was clear to see the passion and skill involved at all stages of production and the amount of care taken with the product and with customer care.